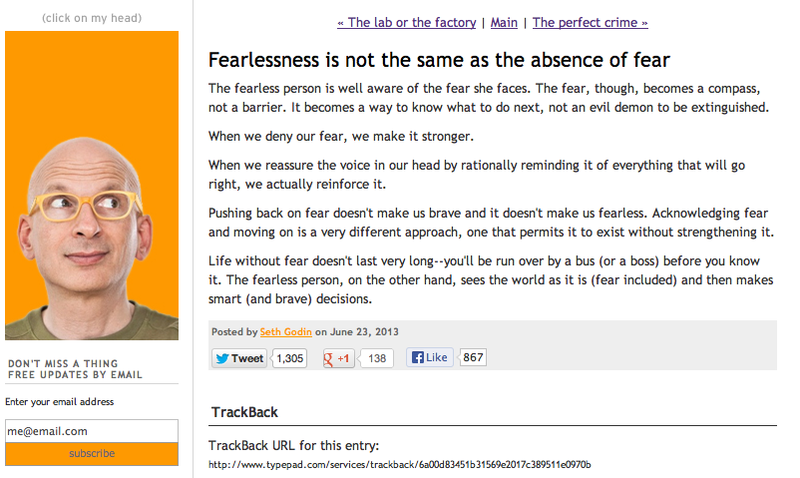 I keep an eye on Seth Godin’s blog. I rate what he has to say on it and in his books. The blog below – click here to read – really got me thinking about decision making. We’re all having to make judgements and choices throughout each day. Some are conscious, others are made as a result of habits – which could be helping or hindering us. The knack is to get practiced at noticing these habitual behaviours or thinking patterns – and then deciding which we’d like to continue, change or drop. Fear, worry, fret or procrastination can seep into all that we do in a sneaky way! By adopting a mindset reframe of “Fear is a compass, not a barrier” we inject a new opportunity. We can start making choices that account for risks, concerns and dangers with a positive forward motion – that takes us where we want to go. Instead of ignoring, avoiding or running away from that fear. Smarter and braver decisions are the result. Thanks Seth.